Otto Nagel was educated as a glass painter, but worked as a transport labourer. In 1912 he joined the SPD, the German socialist party. He served in the army during the First World War, but after he refused to continue he was imprisoned in a camp near Cologne. In 1919 he produced his first oil paintings in a style that was influenced by August Macke. In 1920 he joined the KPD, the German communist party. In 1924-1925 he organised the first general German art exhibition in the USSR. between 1928 and 1932 he published the satirical magazin "Eulenspiegel". During the nazi era he wasn't allowed to work and in 1936-1937 he was detained in camp Sachsenhausen. Many of his works were destroyed. After the war he settled Bergholz-Rehbrücke (near Potsdam) and in 1952 he returned to Berlin. In 1945 he wasa co-founder of the Kulturbund. From 1956 until 1962 he was president of the Akademie der Künste of the DDR. After he died his star was soon fading. The Otto Nagel Haus at the Märkische Ufer in Berlin closed its doors in 1996 and his works disappeared into the depots of the museums. His grave at the Zentralfriedhof Friedrichsfelde by Gerhard Thieme is a monument. His wife Walentina (1904-1983) was buried beside him. 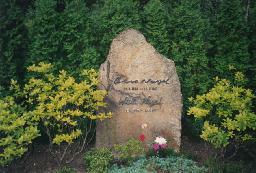 The grave of Otto Nagel at the Städtische Zentralfriedhof Friedrichsfelde, Berlin.